Wavelengths 2 is a fresh, visual exploration of the novels by Virginia Woolf. 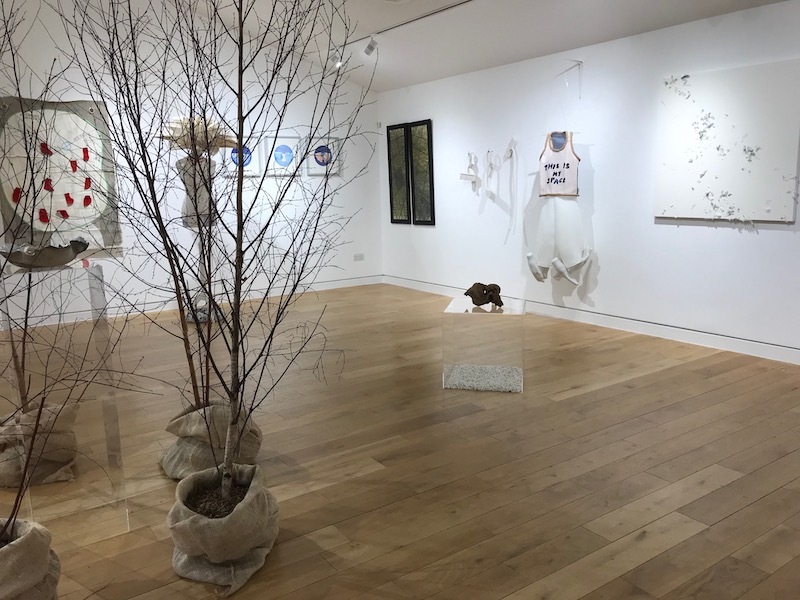 Reconfigured especially for Kaleidoscope Gallery this group exhibition was originally launched as part of Coastal Currents 2018 at Hastings. 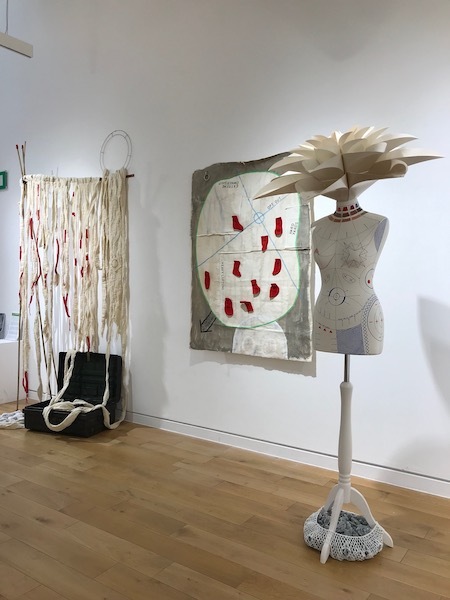 Sevenoaks was routinely visited by Woolf and the exhibition, coinciding with the centenary of women’s enfranchisement, explores the social conditioning of women today alongside recurring themes in Woolf’s novels and life, with diverse and unexpected results. 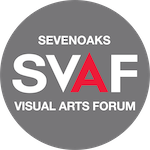 The exhibition includes a collaborative element with the Blue Monkey group at Towner and the artist group includes SVAF members. 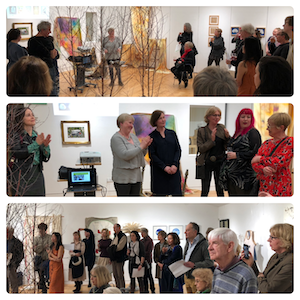 Thanks to all who joined us for a glass of wine, an introduction to WAVELENGTHS 2 by Jane Cordery and several of the exhibiting artists in conversation. 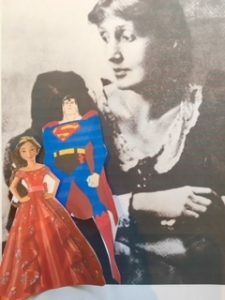 Looking at clothes from historical clothing to superhero costumes and everyday clothes we all wear now. What do clothes say about the wearer? In the workshop we will create a design for a fantasy outfits that reflect our inner personalities or a character from your favourite book. We will make a picture by using fabric and magazine images to make collages. To get inspiration and ideas of how clothes can confer a message, we will look at images of historical garments and some of the clothing in the museum’s collection, children can dress up using the museum’s costume box. Best for adults of any age. No experience necessary. Beginners and intermediates in Art. Experienced artists are welcome to attend but may learn less. 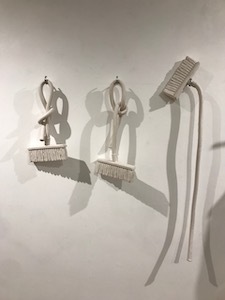 Purpose Drawing, painting and sculpture are often considered to be very different, but many artists today routinely combine these elements in their work. This workshop will demonstrate simple ways in which paint, drawing and ordinary materials can be combined with things that create a line to delineate a feeling or emotion and/or a boundary or territory in both traditional and abstract ways by using inexpensive items. Just come and have fun! 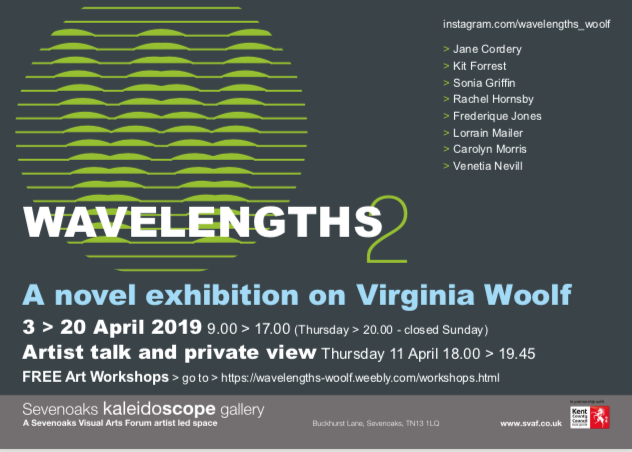 The workshop is an extension of the exhibition WAVELENGTHS 2 showing at Kaleidoscope in April, which artistically interprets the novels of Virginia Woolf. Woolf was one of the first writers to align the use of physical landscape with the internal landscape, using metaphors of rooms, objects and the sea to both explore her character’s state of mind and the female societal boundaries of her time. 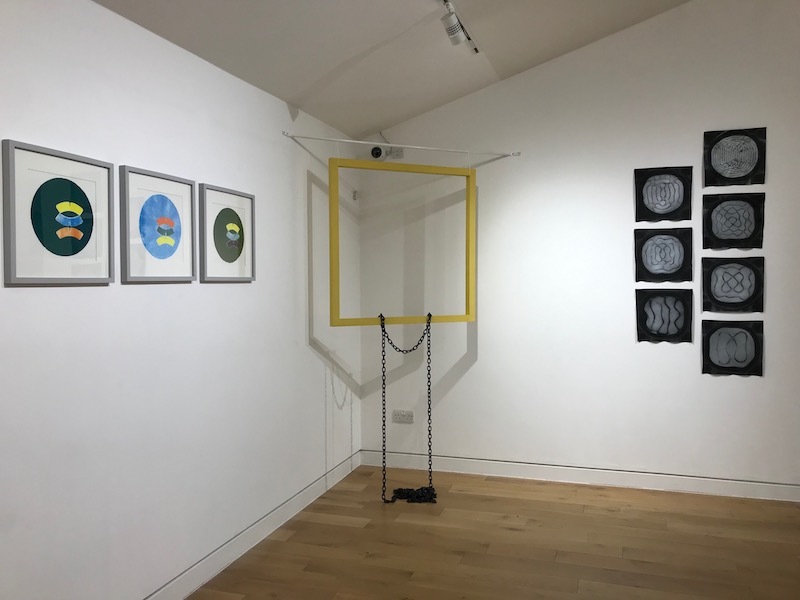 Lead by Jane Cordery, assisted by Lorrain Mailer, both initiating artists of the exhibition WAVELENGTHS. Jane has a BA in Fine Art, has exhibited at the R.A. Summer Exhibition and is an experienced trainer. What to Bring – a photo of your favourite landscape and/or a small object that has emotional significance for you – this can be simply a stick, stone, pencil, poem, bead, piece of material, photo etc. Must wear clothes suitable for acrylic paint (which cannot be washed off) – especially for wrist/arm wear. Coffee and cake provided but feel free to bring drinks/food. 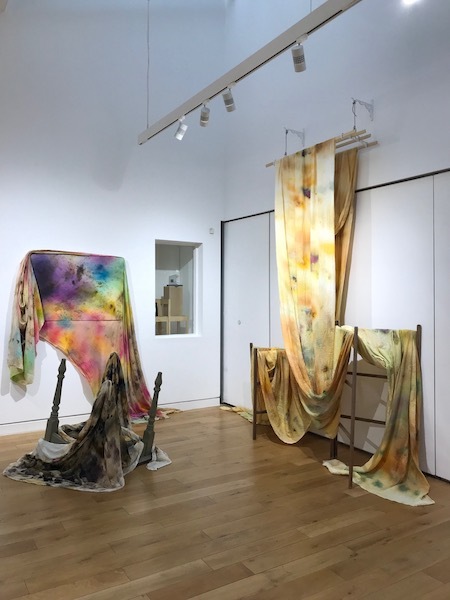 Workshop Outline Ways of using paint/pens/materials, in combination with colour, to express either a physical or internal landscape will be both explored and experimented. 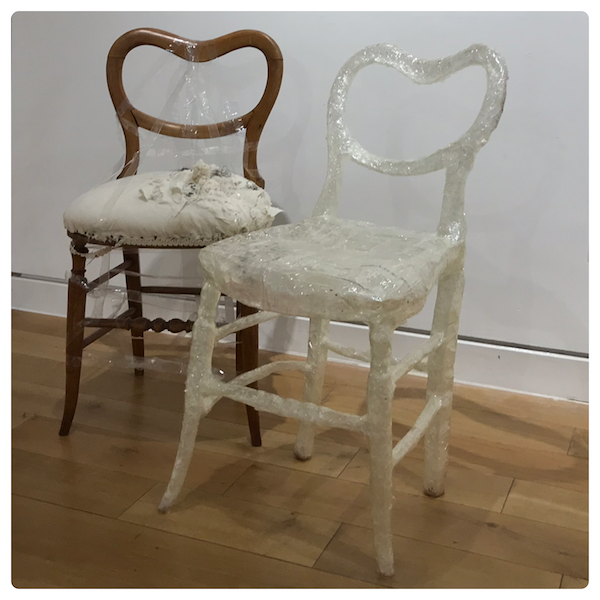 For 14-18 year olds to explore and push to its limit, adhesive tape, like sellotape, as an alternative art material. Aim Enable an appreciation that any material can be used in art to express and explore human emotions and make visible what may be invisible. Lorrain Mailer (currently doing an MA Fine Art at UCA, Canterbury, assists with the National Saturday Club and is a conservation volunteer at Knole) will, assisted by Jane Cordery share themes from the exhibition, of double standards and social conditioning in Virginia Woolf’s novels, within the context of the period and her art practice. With reference to Wassily Kandinsky, Lygia Clark, Karla Black and the concept of spatial space by the collaborative group Numen. Materials Sellotape and coloured (green, blue and yellow) sticky tape and scissors, these will all be provided. 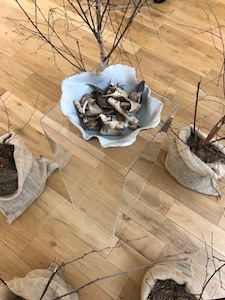 After discussion you will collectively or in groups construct outside the gallery, but within the Library, a response to the space. Talk 5 min PowerPoint of images to show a range of possibilities and effects that can be achieved with Sellotape. 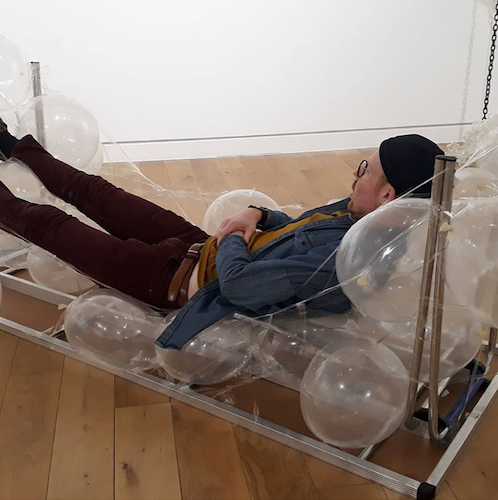 Group interaction Ask participants to work their way through the space allowing for traces to attach to the Sellotape as they interact with the installation. Group discussion What do you think you gained, felt; is there a connection between internal thoughts and outward behavior.